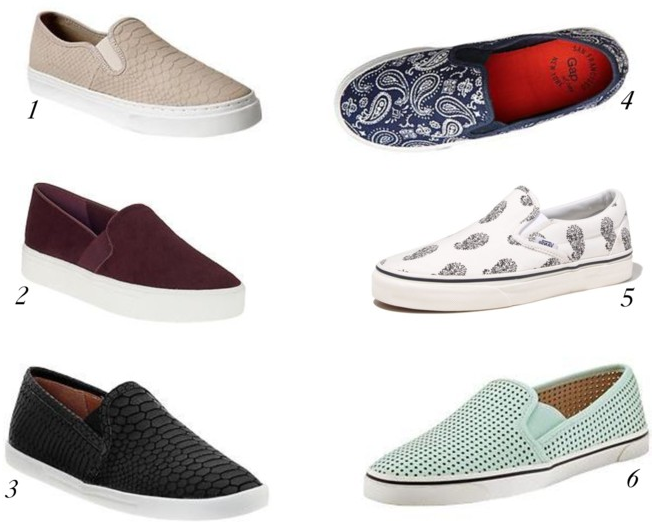 I love the Gap Textured Slip-On Sneaks. They have a few pair on sale right now, but the newest arrivals just came in and the colors are super cool. I have tried these on and I find them to be really comfortable with a good amount of cushion. The Madewell x Vans Paisley Slip-Ons are another favorite of mine and I love the print. These are a bit on the heavy side, but on sale and definitely worth a try on. Word on the street is that the Joie Kidmore kicks are amazing. I have not personally tried these on, but I have seen them on a few girls and they look pretty killer. I'm a fan of all the above and will definitely be grabbing a pair or two for Fall. Which are your favorites? Are you kidding me with those Gap textured slip ons?? Buying now. As much as I would love to have a pair of these, I continue to talk myself out of them. I hardly wear the slip ons I have. And these really take me back big time! I need a white pair to puff paint.